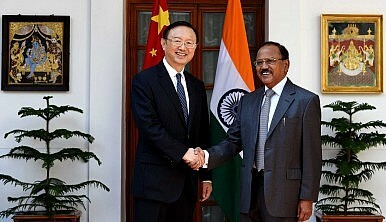 Ajit Doval and Yang Jiechi during the 2015 SRM meeting in New Delhi. No one seems to expect actual progress at the talks — but there’s still good reason to hold them. On April 20 2016, Indian National Security Advisor Ajit Doval met with Chinese State Councilor Yang Jiechi in Beijing for the 19th Special Representatives Meeting on the India-China Boundary Question (SRM). Given the gulf between China and India’s positions and the tangible trust deficit between the two, there were no expectations that these talks would result in any breakthrough. Nonetheless the SRM was ostensibly conducted cordially, with both sides engaging in the usual platitudes of the two countries’ desire to resolve their dispute with a peaceful and mutually acceptable political solution. While negotiations over disputed territory are difficult for any country (even Canada), the Sino-Indian border negotiations appear particularly vexed. The SRM is merely the latest manifestation in a series of protracted border negotiations; the mechanism was introduced in 2003 as an effort to revitalize talks after the proceeding forum had become deadlocked. Yet not long after the 2005 Agreement on the Political Parameters and Guiding Principles for Settlement was signed, the SRM’s progress stalled in the face of the two sides’ intractable positions. Following an increase in the number of incidents along the border the SRM gradually became more focused on the management of the border and bilateral relations. Recently China and India have even been unable to agree over how best to manage the border dispute, with frequent confrontations between patrols along the border. There was hope that Prime Minister Naranda Modi’s state visit to China in May 2015 would revitalize efforts to resolve the dispute and lead to some breakthrough. Yet a resolution proved to remain elusive. Instead, Modi’s visit brought into stark contrast the countries’ divergent positions. India has argued that the time has come to delimit the Line of Actual Control (LAC) that separates the two countries so as to avoid further border confrontations and misunderstandings, which have exacerbated tensions between the two sides. China counters this by arguing that code of conduct that was established in the 2013 Border Defense Cooperation Agreement needs to be expanded and implemented before they could have any hope of adequately delimiting the LAC. A lack of any urgency is partly to blame for the SRMs stalling. In contrast to the regular skirmishes along Indo-Pakistan Line of Control or confrontations on the South China Sea, the Sino-Indian border is relatively placid. Domestic political pressure from nationalists, concerned that any compromise in border negotiations will ensure that their country will be considered weak, removes the political will for the leadership. Indeed Doval’s predecessor, Shivshankar Menon, reportedly stated in 2014 that the technical work toward a settlement has already been completed and all that is left is a political decision. Without any impetus to come to a quick resolution — and with fear of domestic backlash should their government be seen to concede too much — the temptation for the leadership of both sides to retain the status quo has repeatedly proven too great. Perhaps, though, the SRM’s lack of progress can be accounted for by the fact that it has developed into a channel of communication that is too useful to lose. In recent years, there has been a marked increase of confidence building measures between China and India, including establishing the Working Mechanism, which is tasked with resolving any issues that arise on the border. In lieu of any border incidents to resolve and seemingly unable to make any progress on resolving the border, the 19th SRM appeared to turn its focus to efforts to smooth over other bilateral concerns. Specifically it appears that Doval raised India’s concerns over China’s involvement in improving infrastructure in Pakistan-administered Kashmir, its tacit rejection of sanctions on a number of Pakistani terrorists, and the growing trade deficit between India and China. As both countries continue to harbor great power ambitions they will inevitably continue to encroach in each other’s regions to secure their own interests, raising mutual suspicions. It is likely that both China and India will be glad for a dedicated forum to defuse future tensions and maintain the “peace and tranquility,” ensuring that, despite the evident deadlock on its formal purpose, the SRM will continue to meet annually for years to come. Stephen Westcott is a doctoral student at Murdoch University. His area of research focuses on the Sino-Indian border dispute. For the first time since Narendra Modi came to power, India and China will hold high-level border negotiations.